Congratulations! You want to become a Buddhist, and are now curious about where to start, what to do, and why. This article is your handy “quick start guide” to becoming an ‘official’ Buddhist. Living in the ‘West’ (meaning Western countries where Buddhism is not a main religion, such as the United States of America, United Kingdom, Canada, Mexico, Germany, France, etc.) is more of a challenge for someone to be a Buddhist. This is especially true for those who have no connection to the Asian countries where Buddhism flourishes. Since many temples and Buddhist groups focus largely on their cultural connections and membership, it can be a difficult transition to become a “Western” Buddhist. This guide gives you some tips specifically for those of us living in the West so we can start, and thrive, as Buddhists! This article is part of a series on the basics of Buddhism. Click here to view more. Understand Why You Want to be a Buddhist (And What That Means): This is important because it is very easy to give up on being a Buddhist. It is a religion that takes effort, and there are many temptations and attachments in our world that want to pull you away from the path to freedom. Understand What Buddhism is Really About: To piggy-back on why you want to be a Buddhist, you then need to understand what the religion is all about. This means understanding some core concepts. You won’t become a scholar in Buddhism overnight (nor is that necessary), but having a clear understanding of the Buddhist path makes perfect sense. Understand How to Practice Buddhism: After you know why you want to be a Buddhist, and have a clear understanding of what Buddhism is about, you can put that into motion through practicing Buddhism. This occurs every moment of every day. Yes, there are often cultural holidays and rituals, but Buddhism is practiced in the here and now. While you are at the shopping mall, or even taking a shower, Buddhism doesn’t take a break! 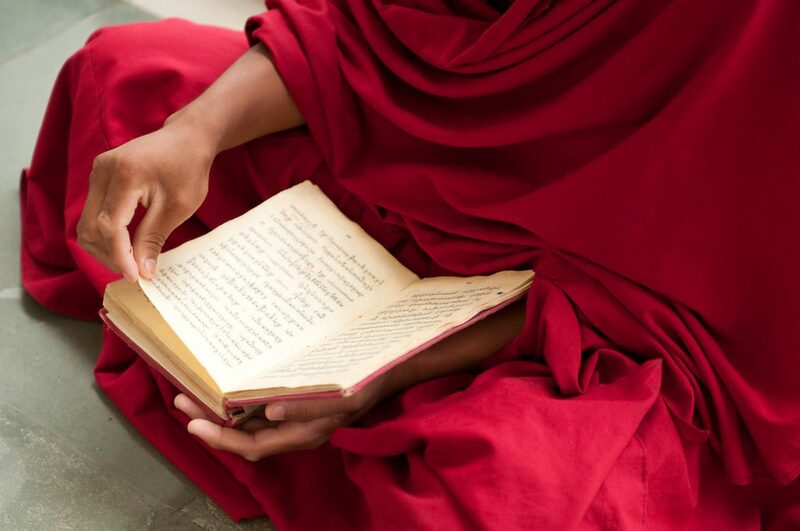 Read Introductory Books to Get Started: To help you practice Buddhism, and to deepen your understanding, it is very helpful to read books by respected authors and monastics. Not only do they become a small library you can refer to for guidance when needed in understanding concepts or difficulties, but they also can help you reinforce why you want to be a Buddhist. Take Refuge and Become a Buddhist (Triple Gem Ceremony): Only after you truly know why you want to be a Buddhist, understand what Buddhism is about (tip: many temples offer introductory Buddhism classes), and are practicing Buddhism, you may feel “this is right”. If so, then it is also the right time to take refuge in the Buddha, his teachings (the Dharma), and his monastic community (the Sangha). This is the ceremony that every ‘official’ (for lack of a better term) Buddhist does, and does so publicly in a ceremony. Many temples even give a certificate or small identification certificate showing you have taken refuge, and many also offer you a “Dharma name”. First it is important for you to understand why you want to become a Buddhist, ensuring you know what that actually means, and to have a strong inner determination. You Know Something is “Off” in Life: You want to become a Buddhist because you understand or feel that something is ‘not quite right’ in our life (called “Dukkha“). This is caused by attachments and desires (i.e., the “Three Fires/Poisons”). These are all topics that may seem confusing, but when understood, it creates an “ah-ha!” moment. We are often wearing ‘rose colored glasses’ in our lives that we don’t really (or not always) see that this is not the life we were meant (or have to) live. It’s like a wheel that is not round and is bumpy (which is what Dukkha roughly translates to). Wouldn’t you want a perfectly round wheel that makes life…right? That’s what the Noble Eightfold Path (often depicted as a wheel) does. The Buddha’s Path Appeals to You: You understand that the Buddha has a way (Eightfold Path) for us to eliminate Dukkha (sometimes loosely translated as ‘suffering’ or ‘dissatisfaction’) so we can stop being attached to things, be truly happy by discovering our natural state (Nirvana), and stop creating unwholesome and/or negative actions (Karma) that is leading to rebirth (this is NOT the same as reincarnation). This May Take a While: The Buddha spent countless eons before conditions were right for him to finally achieve enlightenment and realize nirvana, becoming the (at that time) next Buddha in our world. There was a determination with him through prior existences where he was Bodhisattvas where his determination was there, and continued. The lesson for Buddhists (like you and me) is that we are unlikely to become enlightened and achieve Nirvana in this lifetime. And that’s OK. When we break free from the concept of self, time becomes irrelevant. Imagine it like going to school, a new profession, or boot camp in the military. You are not going to be perfect right off the bat…it takes time and effort! But the payoff is, well, life changing. During these ‘lifetimes’, we build merit through wholesome karmic actions to include practicing Buddhism, meditation/insight, and determination to escape Samsara. Note: While both Theravada and Mahayana Buddhism recognize Arhats, which are enlightened persons (typically monastics) who have achieved Nirvana (there are different levels, including if they are to return again, etc.) and are said to be free of Samsara/rebirth, Mahayana believes that everyone (yes, even Arhats) must eventually become a Buddha in the end and have not truly escaped the cycle of birth and death. This is a major difference between the two branches. Mahayana promotes the Bodhisattva path not just for monastics, but everyone including you and me (laypersons). While enlightenment is certainly possible, and Arhats are absolutely recognized, the escape from the prison of Ignorance / Samsara (cycle of birth and death – our ‘world’) may be a little more complex and take longer (learn more about Nirvana and the Branches of Buddhism). Yes, It *IS* a Religion: This all not only interests you, but is something you want to explore and follow religiously. This is beyond wanting an ‘intellectual’ understanding, but something that you are committed to with your heart and mind (if you are just looking for an intellectual understanding of Buddhism, taking a course like this one, or reading books, will likely satisfy your curiosity but does not mean you want to be a ‘Buddhist’). Some concepts, such as rebirth, can only be explained scientifically to some degree. Also, without actually seeing the Buddha (he has since passed away 2,600 years ago), it is hard to see the living example. Therefore, there is faith we put in to the Buddha’s teachings, and that of the monastic community which helps us understand them. Pulling out the parts we don’t agree with, or want definite answers to, start stripping away what Buddhism is, and what its end result is all about: ending the cycle of birth and death (rebirth). This is the salvation part of Buddhism that separates it from mere philosophy, where we act upon faith from the Buddha’s experiences/insight (Buddha means “awakened one”), and it is a central part of Buddhism (as taught by the Buddha). Buddhism without Rebirth is not what the Buddha taught, and after learning what it really means, is not that foreign a concept. Click this image to download a high-quality PDF version suitable for printing! 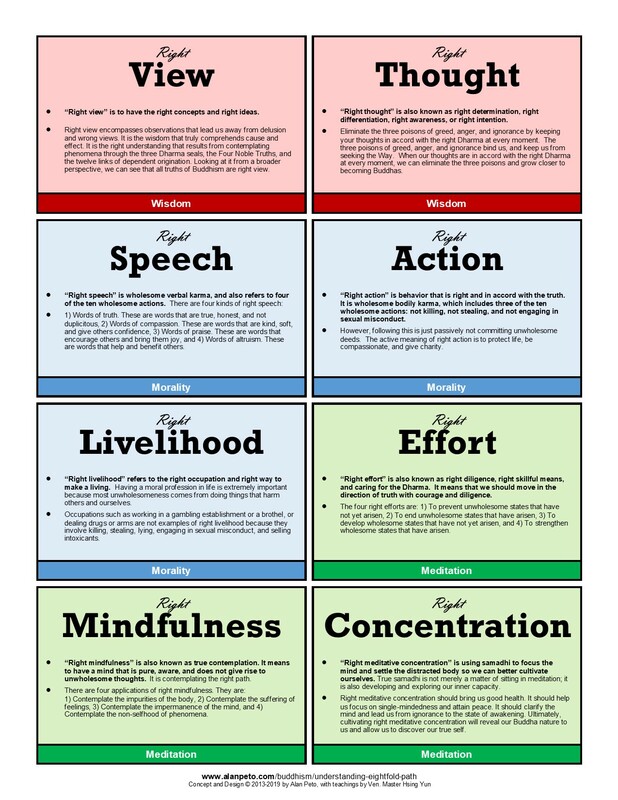 This quick reference card can be printed and placed somewhere you will see it so you can be reminded of the central teachings and concepts in Buddhism. What is Buddhism and Who was the Buddha? I have a whole article about this (click here) which I recommend you read to give you a good explanation. In short, Buddhism is following the example, and path (teachings), set forth by the Buddha of our age (Shakyamuni/Gautama). Through his own effort he was able to become ‘awakened’ (enlightened) to the true nature of our world/life (Samsara – the cycle of birth and death), how it is not perfect through our own actions, and how to realize our nature state (Nirvana). This is why he is often referred to as a teacher, because he was! He spent decades helping others realize Nirvana as well, and end rebirth. And, so can you through his teachings and monastic community which live on. The Buddha said that all sentient beings (such as you and me) all have this ability inside of us…none of us are lacking! What are the core teachings? The Buddha’s first sermon was the Four Noble Truths (which essentially and elegantly explained almost as if the Buddha was a doctor by describing the symptoms, the diagnosis, the prognosis, and the cure). The cure is the Noble Eightfold Path which eliminates Dukkha (caused by attachment/believing in an independent self), allows us to achieve enlightenment/awakening which lets us realize Nirvana, that helps us to end Karma, which ends the cycle of Rebirth (Samsara) we have been trapped in. We, and everything else that is “conditioned” and “temporary” are created by causes and conditions (“Dependent Origination” in Buddhism). Specifically for us, Buddhism teaches “Dependent Origination” meaning everything is conditioned, and temporary (“impermanence”). For example, we are made up of the Five Aggregates, and are a temporary grouping of ‘things’ that make us, “us”. When one of those go, so do we (with the exception of “Store Consciousness” which continues on after death…this is not the same as a soul or reincarnation, though). My favorite book about the core teachings of Buddhism is Ven. Thich Nhat Hahn’s “The Heart of the Buddha’s Teachings“. Is There a Buddhist Bible? While there is no ‘bible’ in Buddhism (as in a document that is written by a god or heavenly being), we do have scripture which are primarily the disclosures/teachings of the Buddha, precepts, and insight into those teachings. Theravada Buddhists call them “Suttas” and Mahayana Buddhists call them “Sutras”. The main scripture that most laypersons (like you and me) and all Buddhist branches read, is called the Dhammapada/Dharmapada. There are also a lot of other scripture and teachings (especially on the Mahayana side of the house), however these are the ‘overall’ big parts of Buddhism. Click this image to download a high-quality PDF version suitable for printing! 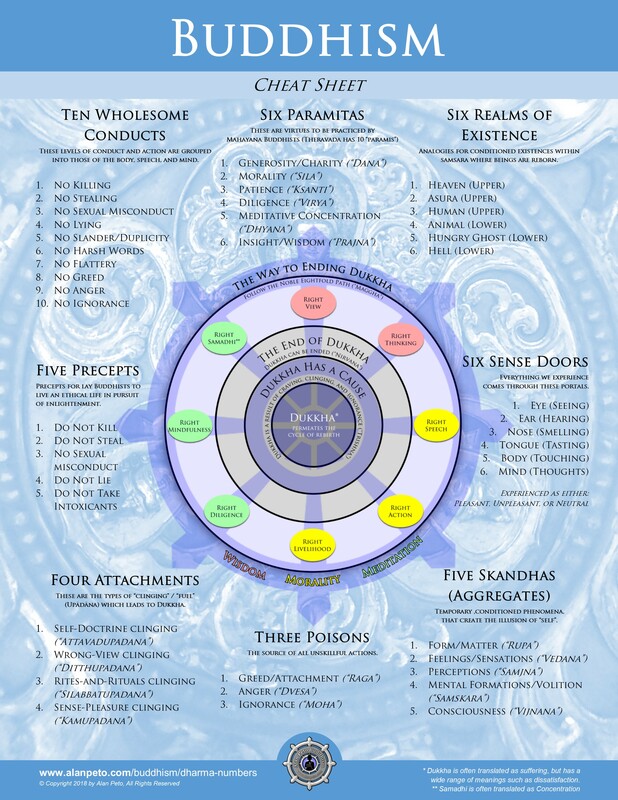 The Noble Eightfold Path is the fourth noble truth and provides the guide to achieving Nirvana. Mahayana or Theravada? There are two main branches of Buddhism which are Theravada and Mahayana. Typically, which branch of Buddhism you follow and practice in depends on which country you were born in. For example, you are a Theravada Buddhist in Thailand, but a Mahayana Buddhist in Japan or China. It is typically as clear cut as that, and often due to cultural reasons. For the Western Buddhist, it gets more confusing. With virtually ever single type of Buddhism being available in Western countries (to various degrees and locations), it can be hard to pick. Traditionalists will often promote Theravada as the “only” “true” Buddhism to follow. Whereas Mahayana is promoted as being more accessible to laypersons (like you and me) and offering more variety. This is a purely personal choice, and while it is great to actually choose (compared to just following whatever is in your country), it can be overwhelming. My advice is start with whatever temple, group, or practice is around you that you feel comfortable with. The Buddha’s teachings are exactly the same in Mahayana and Theravada. The biggest difference is that there are additional scripture (Sutras) in Mahayana, and Mahayana focuses more on laypersons. I have been in both branches of Buddhism, and routinely read and listen to teachers on both sides. There is absolutely no downside when it comes to the teachings/Dharma! However, the beginning Buddhist should primarily focus on one school with a good teacher and go from there. To learn more about the two branches of Buddhism, read my article here. Threefold Training: Buddhist practice centers around three main ‘parts’: Wisdom, Morality, and Meditation. You have to practice all three of these (and for beginners, at least striving towards all three, of course) to be a Buddhist. For example, just ‘meditating’, while neglecting morality and gaining wisdom, is not Buddhism at all. My favorite book on the threefold training is “For All Living Beings – A Guide to Buddhist Practice” by Ven. Master Hsing Yun [Mahayana]. The Sangha (monastic community/teachers) are the ones that will help you with this threefold training (you don’t want to do this alone!). The Threefold Training is important, because it is what we follow on the Noble Eightfold Path that allows us to cut through delusions, desires, hatred, and attachments. Through it, we gain insight and wisdom, which allows us to become enlightened/awakened. That in turn allows us to realize Nirvana, which allows us to stop creating Karma which has kept us in the cycle of rebirth (Samsara). In short, it’s important for practicing Buddhists! 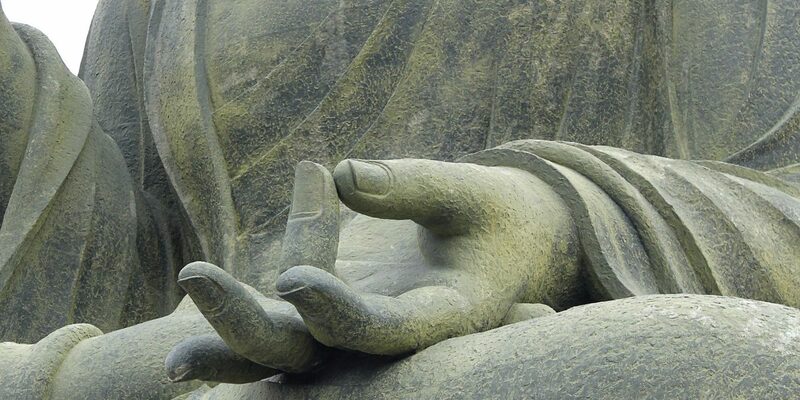 Supporting the Monastic Community (Sangha) and Others: A central part of Buddhism (explained in the last part of this guide) is taking ‘refuge’ in the Buddha, the Dharma (teachings) and the Sangha (monastic community). The Sangha are those who are on taking that ultimate next step by committing their life to realizing Nirvana through enlightenment. And in the process, they help the lay community (you and me) in our path (especially with the Threefold Training as explained above). Supporting the monastics (and other people in our world!) also helps us generate wholesome Karma (and merits) as we are likely not going to achieve Nirvana in this lifetime, and we want these wholesome ‘seeds’ to be planted through our Karmic actions. Your ‘harvest’ of crops (wholesome Karma [actions]) you are planting right now may not bloom during this lifetime, but with the right watering, fertilizer (yes our world is ‘smelly’, but with no mud/stink, we can’t grow! ), and care…we can follow the Eightfold Path ‘easier’ in the future. If we don’t do this, we are going to keep getting stuck in the same old runt. Note: I mention you/we, but that is just ‘grease on the wheels’ with explaining this. Now “Karma” is great when ‘wholesome’, because it helps us on this Eightfold Path towards Nirvana. But when we get to realize Nirvana, it is so we generate NO Karma! Karma, even wholesome Karma, keeps us trapped in the wheel of Rebirth and in the muddy waters of Dukkha. But that’s not where we need to stay! Wholesome Karma allows us to eventually ‘bloom’ when the conditions are right (much like the Lotus flower, which is used often in Buddhism, which spends its life in muddy waters, only to break the surface into a beautiful flower (perhaps becoming a monastic, etc.). That’s what we are striving for, and not spending our lives in the muddiness of the muddy water (Dukkha/Samsara/Rebirth) because that is not where we are supposed to be. Buddhism believes in something called non-self, which means you do not have an independent self and are made up of “five aggregates” which are a temporary grouping that makes you…”you”. You’re done after any one of those aggregates goes away. But the thing that continues on is those seeds…your actions (Karma)…which are planted in something we call a ‘store’ consciousness. That’s the only thing that continues on after death in this endless cycle of rebirth. Not only do you want to plant these ‘good seeds’ so the ‘next’ being that comes into existence can benefit from it, but also wouldn’t it be nice if you had support in this life…right now? That’s what we are doing for the monastics, and others. Yes, we may have had it tough (or now are), but kindness and morality are something you have power of…you control that! Now imagine if everyone was like that. In many ways, there are countless people who do that, and have made an impact in your life (and others) that are often subtle but profound. The same is for our monastic community, as they can help guide you to generating this wholesome Karma that can help you long-term. Click this image to download a high-quality PDF version suitable for printing! 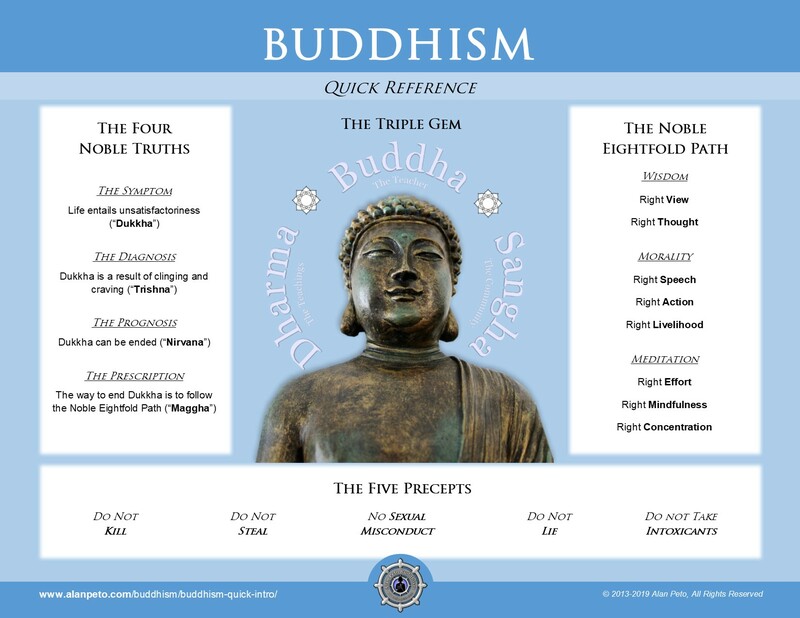 There are lots of “numbers” and teachings in Buddhism, and this quick reference card can help you remember the top ones! The final step in becoming an ‘official’ Buddhist is to take refuge. This means refuge in the “Triple Gem” (“gem” is used to signify it’s importance, value, and worth in our practice and beliefs) which is the Buddha (teacher), the Dharma (teachings), and the Sangha (monastics/community). Teach one is interconnected with the other, and not supporting or believing in one doesn’t make you a Buddhist then (sorry). The Ceremony: Taking refuge is commonly called a “Triple Gem Ceremony“. Many temples offer these once a year, or more. Often they will have classes that you will need to attend so you understand what becoming a Buddhist means, and what the Triple Gem is all about. This is a good thing so you fully understand what becoming a Buddhist means. But first, you need to find a temple and a Sangha (monastic community) for this! Find a Temple: You should first find a Buddhist temple/group that matches your interest and where you feel comfortable. This is a deeply personal choice, and thankfully you have many choices. Buddhanet has a long-running list of temples and groups worldwide! Check out the list here:http://www.buddhanet.info/wbd/ (this may not be 100% complete or updated, depending on the information they get, but it can help. The main Buddhist schools/branches are Theravada (practiced mainly in the southern Asian countries), and Mahayana (practiced mainly in the northern/eastern Asian countries). There is also Tibetan Buddhism (the Dalai Lama is perhaps the person you think about when you hear the word ‘Buddhism’, and he is head of Tibetan Buddhism) and makes up the smallest percentage of Buddhists. Talk to the monastic(s) there and express your interest in learning about their practice of Buddhism. Often they will be more than willing to explain and show you around. Mainly large Buddhist temples, such as Hsi Lai temple in Los Angeles, feature English classes on Buddhism. You are very likely entering ‘cultural’ Buddhism, so be aware of what that means. With rare exceptions, you are going to experience monastics and temples that are not ‘American’ or ‘Western’. Many will not even speak English or are limited. This means they are based on Buddhism from another country, along with those cultural practices. 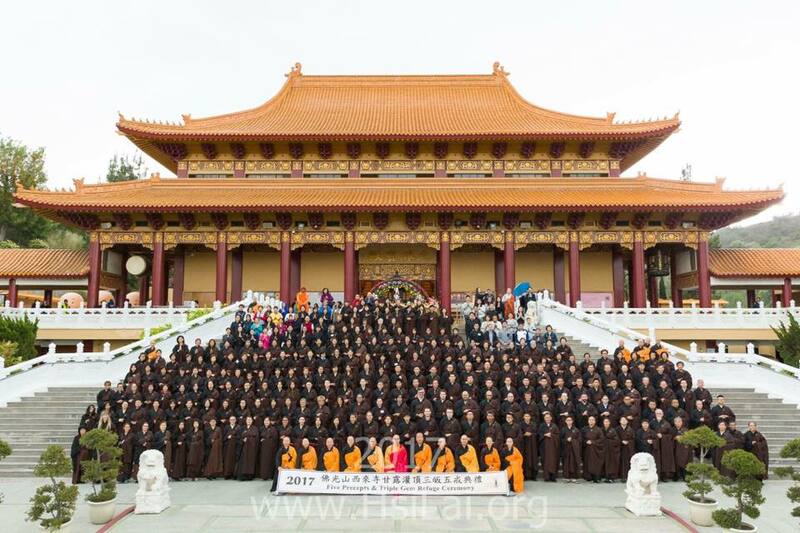 For example, my refuge temple is Hsi Lai which practices Chinese Buddhism (Ch’an or Zen Buddhism and Pure Land Buddhism). As the largest temple in North America they get their fair share of visitors and English speaking Americans coming there, but their largest membership are Chinese speaking (especially from Taiwan) and the cultural events are specific to them. Most of these ceremonies mean nothing to me, even though they are interconnected with Buddhism (as practiced in Chinese Buddhism). This can make you feel “apart” and uneasy at times. Especially if chanting in a foreign language (some larger temples may have English speaking Dharma services, which is recommended), which can be too difficult for some. While some are ‘attracted’ to Buddhism because of the cultural differences (some may find Asian culture connects with them or is interesting), this is not required for Buddhism. Because the majority of Buddhists, and Buddhism acceptance, is in Asian countries, that is where our temples and monastics come from (and we should be thankful they exist)! My recommendation is to learn and enjoy these cultural differences, and you may even learn something! However, do not feel you need to practice all those cultural traditions and/or fully embrace them. While that can leave you ‘out’ as cultural traditions are often a ‘glue’ many countries have with their embrace of Buddhism, it is not central to the Buddha’s teachings. The Buddha’s teachings are cultural/country-agnostic. This was a very high-level guide of becoming a Buddhist in a Western country. There are challenges with no ‘home-grown’ Buddhism in our countries, but there can also be tremendous opportunities for learning not only about Buddhism, but of other countries and cultures. Because Buddhism talks about how we are all interconnected (dependent-origination), this is a side-benefit from not having a truly ‘Western’ form of Buddhism we can embrace. Without getting too deep (that would encompass an entire article! ), you can be a Buddhist and also be practicing another religion (such as being a Catholic/Christian). There are plenty of Christians who are Buddhists, and also Jews who are Buddhists (who have their own pretty neat name: JuBu‘s). Most will look at their primary religion, such as Christianity as primary, followed by being a Buddhist. And that makes sense. For example, if you are a Christian/Catholic, God [Jehovah/Yahweh] is first and foremost in your life as, well, God! And in that vein, you have commandments from God. Since Buddhism doesn’t conflict with them, you are still worshiping a god, and that means that will be first in your life (and Buddhism is secondary). Because Buddhism does not have a central figure that is worshipped (the Buddha is a human being, not a god), there is not conflict with the Ten Commandments. However, actually practicing two religions can be difficult, to say the least. Are you prepared to go to Mass for an hour, and then a Dharma Service for another hour or two? Can you keep the central beliefs and practices of both religions in your head, and be able to navigate your daily life with them central and without conflict? Have you talked to your pastor, priest, rabbi, etc., to see if it is “O.K.” for you to also be a Buddhist (this may require you to provide them some education on what Buddhism is about)? Why do you want to be a Buddhist also? You should have answered that question already (as it is #1 on my list above), and if so then you have to answer why you also want to practice your original/other religion? This sounds like a trick question, but it is not. You may find that it deepens your love of God and/or Jesus. Or perhaps it just all works for you. This is a personal question you have to answer, but also must include a religious figure from your faith in so you are not in any conflict. These are some of the many questions you need to ask of yourself, and your other religion. Some who have lost faith in their religion have found Buddhism provided them a “way back” to their original religion, and that’s great! Buddhism was a raft back to their religion, and then they discarded it (perhaps learning a few things that helped them deepened their love of others, etc., in the process). The Buddha never required everyone to become a Buddhist (in one story, he said ‘no’ to a prominent member of the community who was willing to give up his faith to follow the Buddha….have you ever heard of a religious figure or religion in general turning someone away?!). This was because the Buddha (and thus Buddhism) wasn’t looking for converts, but accepting of those who are ready to accept and follow the teachings. Also, it was what was best overall. In that story, the Buddha realized that it would not be in the best interests of that person or his family and community for him to follow the Buddha, and that he could do more good in his current religion. So if you want to be a Buddhist, you should do so with all your heart, unless you can successfully navigate and understand both religions and what that means. It can be very difficult to practice two religions, and you shouldn’t discard your original religion carelessly! The only time when this is a clear cut answer is if you want to become a monastic. If you are a monk or nun in Buddhism, that is your religion and nothing else. This doesn’t mean there is not interfaith dialog (there is, famously seen frequently with the Dalai Lama, Ven. Thich Nhat Hanh, Ven. Master Hsing Yun, and others), but that you are “all in” with Buddhism (which makes sense, if you are a monastic!). Thank You: To Venerable Sanathavihari Los Angeles for his assistance with this article and book recommendations for Theravada. Further Reading: My collection of articles on the basics of Buddhism, and my article Buddhism a Quick Intro. Many of my articles are linked in the article above.